Heat the oven to 350°F. Unfold the pastry sheets on a lightly floured surface. Roll the pastry sheets into 2 (12-inch) squares. Cut each square into 24 (2-inch) squares, making 48 in all. Using a sharp knife, cut diagonal lines from each corner of the pastry squares to within 3/4-inch of the center. Fold every other corner to the center and press to seal. Brush the pastries with the egg mixture. Place the pastries onto 2 baking sheets. For Bittersweet Chocolate Superstars, omit the gorgonzola cheese and dates. Stir 4 ounces bittersweet chocolate, finely chopped and 1/2 teaspoon cracked black pepper in a small bowl. Spoon 1/2 teaspoon chocolate mixture onto each hot pastry. Sprinkle with confectioners' sugar before serving. For Garlic & Rosemary Superstars, substitute garlic & herb spreadable cheese for the gorgonzola. 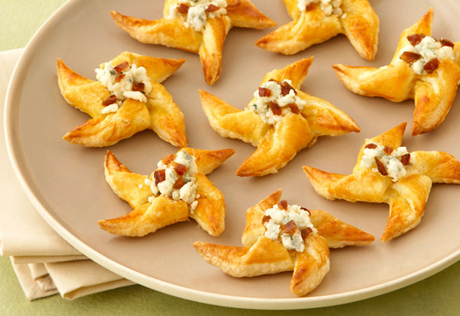 Pipe or spoon the cheese mixture into the pastries and top with the dates. Sprinkle with 2 tablespoons chopped fresh rosemary.